The MBTA is the authority that runs public transit in Greater Boston. Over the last few years, ridership has skyrocketed and gas prices and environmental have increased. But “The T” has been held back by structural debt, aging infrastructure and perhaps some days by its self too. This Spring, we’re headed in to a political season that would hold huge opportunity for public transit. The Governor has made some big proposals, so you expect that the T would be rallying the 1.3 million people they serve a day for support. However, over the years, the T’s communications to their own riders have left a lot to be desired. Take a look at how the MBTA is currently talking to its customers who would be their most potent political allies. Imagine a series of ads suggesting that your customers should try to behave better than animals. 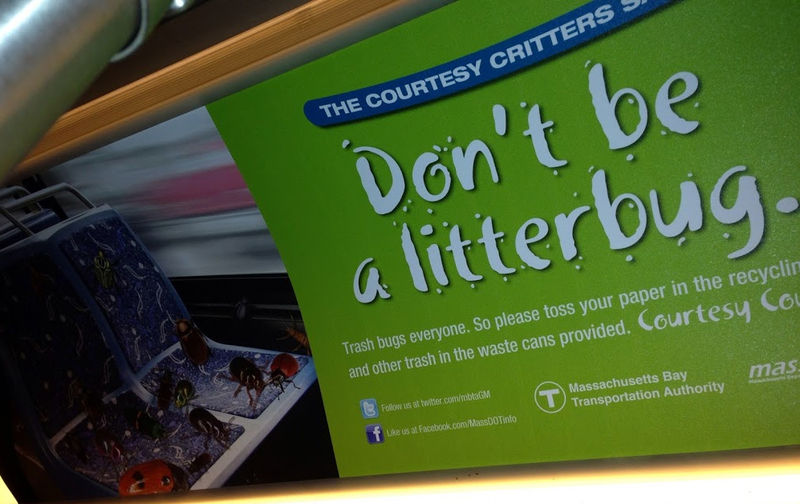 Yes, they’re using cute copy like “trash bugs everyone“, along with assertive alliteration and photos of animals. Who doesn’t like marketing with animals? But any campaign that compares their paying customer to animals walks a risky line, one which this campaign steps unhesitatingly across. The ad compares customers to gross looking insects, the kind you might not want to be confined with in underground subway system. And framed as “The Courtesy Critter Says”, its contrived cuteness is reminiscent of Ranger Rick. Is this really how the Athens of America talks to itself? This message sets up two sentences in a sort of “give and take” equation. One reminds that the cleaning of the subway is done with *your* tax dollars. The other reminds you to do *your* part by clearing-up. Huh? Its like the two sentences aren’t aware of each other. The message also craters visually. 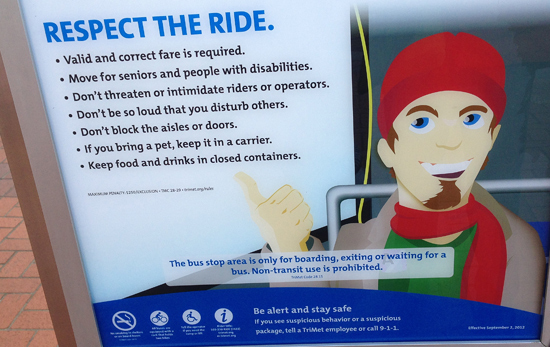 The use of the “don’t icons” confusingly suggest that newspapers, drinks and food are banned from the subway. Better iconography would show them being thrown away. The result is the T’s staff areleft to do this with marginal air cover from these efforts. Here’s how Portland, Ore. sets the tone of respect they want to create with their transit riders. 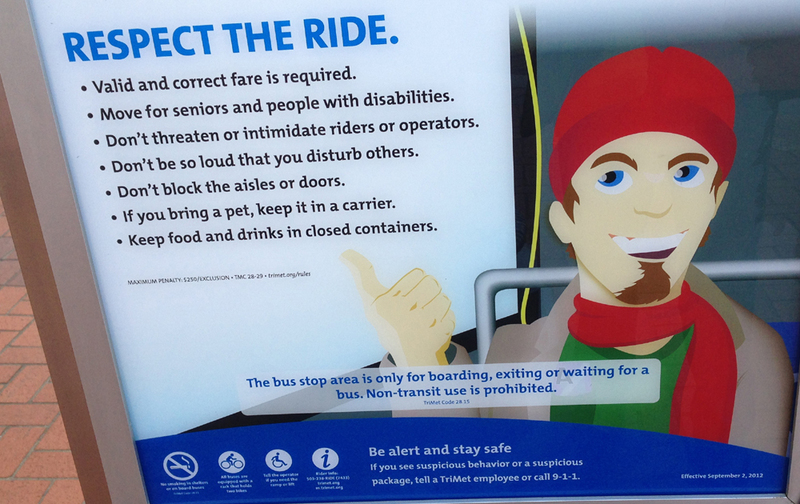 They show “a dude” who embodies some hip Portland values, and he reminds riders to care for one another. It sets a positive tone from a rider’s point of view, which makes a more sympathetic case to be good to your fellow riders. Portland’s message is at least decent at what it does. The T can be a vital part of communities or an aloof, semi-solvent regional transit monopoly. 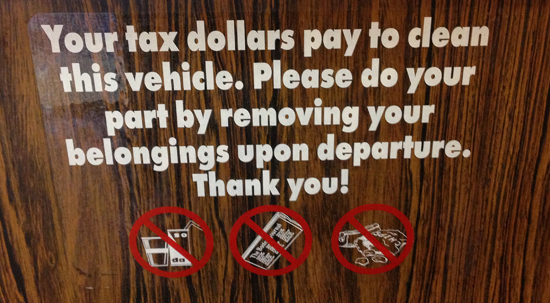 How it speaks to its riders and stakeholders will determine which of those boxes they put themselves in to. Their staff do this every day, their communications need to catch-up. Earning passionate advocacy can elevate funding transit from being a “must try” to “must win” political issue. Just as campaigns have shifted to digitally empowering their supporters, the T and its supporters need to raise a connected tribe of advocates. And this would start with more effective and positive communications. 1 Response to "MBTA Advertising Mixes Disdain and Disregard"
Thank you for pointing out how broken the subway’s “clean up after yourself” signs are. That’s so true. Any parent can nag with more grace than that.